Clifford, Agnes Marie (nee Page). Peacefully, at Grandview Lodge on Thursday January 11, 2018 in her 92nd year. 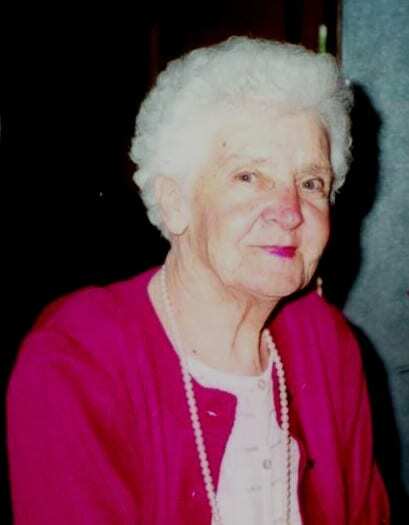 Agnes Clifford beloved wife of the late Gerald Clifford. Loving mother of Kathy Caughell (Wally), Geraldine Dexter (George), Judy Cutler (Dave), and Jerry Clifford (Mary). Proud and loving grandma to Tammy (Gary), Laurie (Jeff), Chris (Rocchina), Brad (Judy), Scott (Trudy), Nicole (Matt), Lisa (Darren), Alisha (Justin) and Chelsea. Great grandma of Kayla and Emma and great great grandma of Ben. Lovingly remembered by her brother Neil Page and sister Anna Schroder (Ray). Predeceased by her parents Tab and Nellie Page and by her daughter Janet. Lovingly remembered by her nieces nephews and their families.